Vinyl is back, no doubt about it. Sales of vinyl records have been soaring, although they still represent only a tiny fraction of the music industry’s revenues: about 2 percent in 2014. Is this growth because, as some respected sources breathlessly state—I’m looking at you, Wired magazine—vinyl sounds better than digital media? Or is there some sort of retro-hype going on? It’s true that some digital media really don’t sound very good. Low-bit-rate MP3 makes compromises in fidelity, as does low-bit-rate AAC, the higher-tech successor to MP3 that is used by iTunes and YouTube. Low-bit-rate AAC files are also what you typically hear on Pandora, Spotify and SoundCloud, and on your phone. While they are OK for casual listening in the gym or the car, many people can hear their limitations in a quiet environment. Speed variation. Listen to a recording of a solo piano on an LP, and then on a CD. I’ll bet you can hear the difference immediately. Vinyl depends on a mechanically driven system, and any such system will introduce minute changes in the speed and pitch of playback. A vinyl record that is even slightly warped, or has a hole that is not perfectly centered, will have “wow”—slow variations in pitch. Tiny imperfections in the belts or wheels of the turntable will cause more rapid pitch changes, known as “flutter.” CD players, because they use super-accurate digital buffers, are immune to this. Channel separation. On a CD, the separation between the left and right channels used in recording is over 90 dB. On LPs, it’s 30 dB at best. That means engineers have a much narrower range to work with when they’re mixing and mastering the audio, and the result, for the listener, is that the stereo “image” is highly constricted. It’s worse at lower frequencies; a loud bass signal in one channel of a record can push the needle out of the groove, so engineers have to make sure bass frequencies are always in the center. Continuous vs. “chopped up.” Some people believe that because digital audio “chops up” the signal into discrete numbers, it cannot carry all of the information that an analog signal does. But before the digital signal reaches our ears, it is reconstituted into a continuous analog wave. The process does filter out sounds above 20 kHz, which is the highest frequency the most acute human ears can hear. However, no phono cartridge, amplifier or speakers can reproduce those frequencies anyway. So really, nothing is taken out that affects the sound. Ask the Expert. "Does Music Sound Better on Vinyl Records than on CDs?" Tufts Now. July 11, 2016. 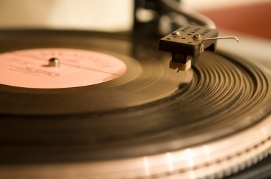 Accessed July 12, 2016. http://now.tufts.edu/articles/does-music-sound-better-vinyl-records-cds.